CHARLOTTE, N.C. (AP) Nic Batum said it felt like old times having coach Steve Clifford back on the bench Wednesday night. 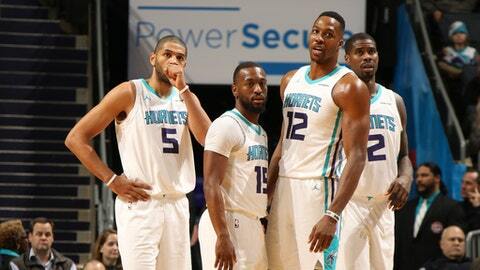 Michael Kidd-Gilchrist scored 21 points, Dwight Howard had another double-double and the Charlotte Hornets used a record-setting first half to beat the Washington Wizards 133-109 in Clifford’s first game since Dec. 1. Clifford returned after missing 21 games because of headaches caused by sleep deprivation . The 56-year-old Clifford said it was great to be back and his focus is squarely on winning. The Hornets were 9-21 in Clifford’s absence and had fallen eight games under .500. The Hornets shot 65 percent from the field in the first half, including a pair of four-point plays from Walker and Marvin Williams. Bradley Beal had 26 points for the Wizards, whose five-game road trip got off to a rocky start. Brooks was upset with his team’s play and suggested changes are coming. Wizards: Have allowed at least 100 points in 16 straight games. … Were outscored 50-30 in the paint. Hornets: The 10 straight field goals made to start the game are the most to start a game since 2002-03. … With a 23-point lead in the fourth quarter, Hornets fans started chanting ”We want (Malik) Monk.” Clifford put the rookie in with four minutes to play and he hit a 3-pointer. Charlotte’s Michael Carter-Williams and Washington’s Tim Frazier were given double technical fouls and ejected after an altercation with four minutes remaining in the game. It started when Jason Smith fouled Carter-Williams, who went to retaliate before Frazier stepped in the middle. The crowd roared with delight after Howard made both shots, and Clifford quickly removed him from the game. The teams played in front a sparse crowd because of the wintry weather that has gripped Charlotte, which led to most schools being closed. Across town, the Charlotte Checkers of the American Hockey League played in an empty arena because the game was closed to fans due to the wintry mix. Wizards: Visit Detroit on Friday. Hornets: Host Miami on Saturday.